At our family practice, we are a close-knit community; a collection of industry-leading physicians, nurses, and administrative staff who are trained to the highest professional standards. Our team possess a wealth of education and experience garnered over many diverse histories to collectively deliver an extensive range of specialised medical services. We want you to be comfortable when visiting our medical centre and are pleased to provide our patients with an immaculate and stylish facility that caters to your every need, resulting in the optimal patient experience. Alongside Clinical Director Dr. Shane Morley and Family Practice Administrator Arianne Morley (a true family affair), all our physicians, nurses and administrative staff endeavour to produce a convivial and welcoming environment, shaped by clinical excellence and outstanding customer service. We understand life isn’t always straight forward – time, family, last-minute emergencies, these things happen – but we’ll do our best to make it as easy as possible for you and your family. That’s why with Rokeby GP, a trip to the doctors has never been more convenient. Rest comfortably: you’re in safe hands. Please provide a minimum of 2 hours notice if you are unable to attend your appointment. We can relocate your appointment to someone on our waiting list. If an appointment is missed or reception is not adequately notified a late or non cancellation administration charge will apply. We place a strong emphasis on reducing waiting times to an absolute minimum for all our patients, and have developed policies to best achieve this convenience. Through years of experimentation, we have whittled the practice’s average waiting time down to approximately seven minutes. When booking an appointment our reception staff will assist you in booking the right amount of time, and the right service to tend to your concerns. Any extra information provided regarding the nature of your appointment, whether it be for travel, drivers medical, mental health etc., will assist us in making the correct booking for your visit. Our regular appointments are generally short consultations of up to fifteen minutes (relating to one or two concerns) or long consultations (three or more concerns, complex matters, travel, or mental health). We pride ourselves on reducing our wait times for all our patients. With this in mind, we advise booking an appropriate length appointment tailored to your query/queries. Standard appointments cover 1-2 minor health concerns only. Long appointments – 3 or more health concerns, complex health problems, and mental health appointments. Our physicians do not conduct nor receive phone calls during consultations. If your concerns are urgent, please advise the receptionist as to the nature of your enquiry, and the information will be forwarded to your physician forthwith. If a phone consultation is required charges will apply. Our surgery is a Private Billing practice. This includes Pension Card holders but excludes DVA. Children 11 years and under are discounted on weekdays only. The cost of the consultation will vary depending on the complexity and duration. Billing is at the discretion of your doctor. Repeat prescriptions and referrals may be obtained without booking an appointment via a phone call to reception – in accordance with your doctor’s approval (and upon their discretion). Identification will be required at reception upon collection of the script or referral. There is a 24-hour turnaround for this service. This service incurs a charge. For information on our prices please refer to our practice information sheet available from our reception. Initial visits will require payment on the day of service. Once claims have been accepted, costs will be forwarded to the relative insurance company. Your physician will inform you of your results during your follow-up appointment (if needed). If results require urgent attention, a nurse will contact you with the necessary details. We do not routinely call patients regarding normal results. This practice has an automated reminder system, and you may receive an email, letter, phone call, or a text message as an alert for an upcoming or follow-up appointment. Only long appointments and new patients appointments will receive a text reminder or email reminder. We do not send text reminders for short appointments. Our practice is fully computerised and all personal health information recorded by your doctor is kept strictly confidential. Records are kept up to date and as accurate a possible. If you would like a copy of your records transferred to another practice our reception staff can arrange this. Pre payment is required. Your records to that date will remain on our system. If you attend Rokeby GP in the future we can access those records. Please refer to the homepage for our opening hours. We are closed on public holidays, and from 5pm on Christmas and New Years Eve. Lift and stair access is via our entrance at 142 Rokeby Rd., and through Friendlies Chemist (located in the same premises as our clinic). Our central Rokeby Road location is easily accessible by motor vehicle, with plenty of free public parking available behind the surgery (next to the Coles shopping complex). This includes ACROD parking. We value honest and open communication with our patients. Your feedback is very important to us, and has proven very helpful in shaping and improving our clinic. Many of our improvement initiatives have been implemented as a direct result of your comments. We respect the privacy and rights of all our patients, and maintain diligence over all confidential information. Our physicians and staff are aware of confidentiality requirements and recognise that significant breaches of patient-clinic trust may provide grounds for disciplinary action and/or dismissal. 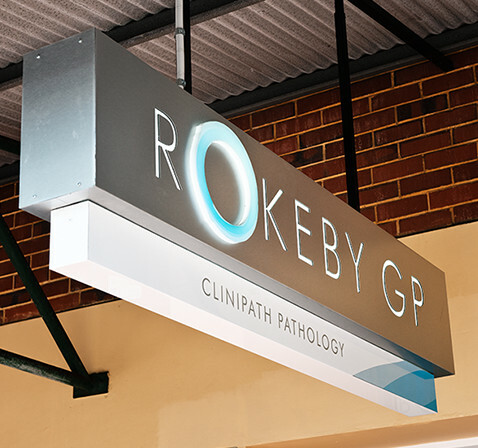 Rokeby GP complies with Federal and State privacy regulations including the Privacy Act 1998, the Privacy Amendment (Private Sector) Act 2000 and Victorian Health Records Act 2001 as well as the standards set out in the RACGP Handbook for the Management of Health Information in Private Medical Practice 1st Edition (2002).